I wanted to say I am sorry for the loss of your son. I did not know how old he was. I thought he was a little bit younger than I am and I did not know if he was armed or not. “I’m sorry, sir, you’re not really addressing that to the court. You’re doing it here for the victim’s family, is that correct?” asked prosecuting attorney Bernardo De La Rionda. 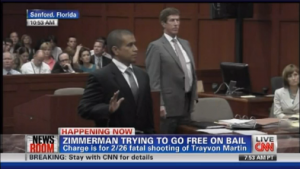 “They are here in the court, yes,” said Zimmerman. “I understand. But I thought you were going to address your honor, Mr. Judge Lester, not — So that’s really addressed to the family and where the media happens to be, correct Mr. Zimmerman?” asked De La Rionda. “I felt sorry that they lost their child, yes,” Zimmerman told the prosecution, referring to Martin’s parents. “Why did you wait so long” to tell the teen’s family he was sorry, asked De La Rionda, repeatedly questioning Zimmerman as to whom he had expressed his apologies for the shooting of Martin and why he had waited some 50 days to so. “I was told not to communicate with them,” Zimmerman responded, adding that he had told his attorneys to give his apologies to Martin’s family. De La Rionda then asked Zimmerman about contradictions in his statements to authorities, while Zimmerman maintained that he had “absolutely not” altered his story. He was also questioned about his cell phone records, as well as whether he had sent a message referring to Martin’s father.